You would be shocked to see how much paper we go through in this house. 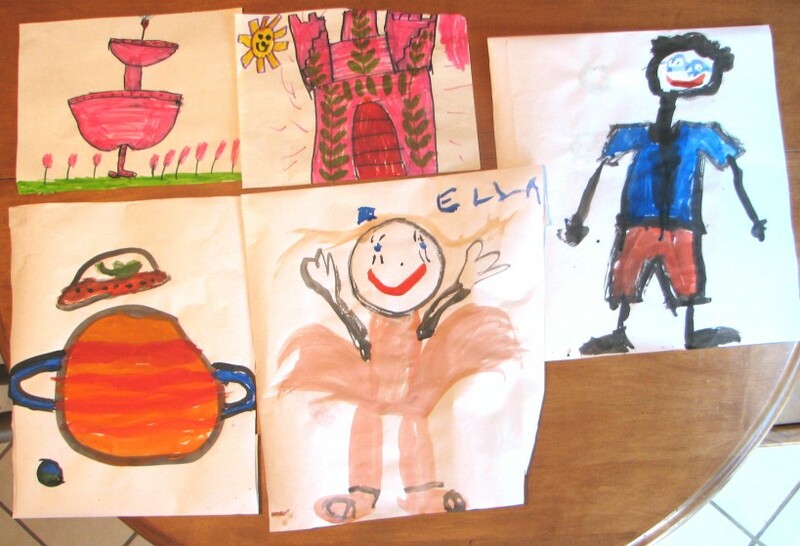 Every month or two, we sort through enormous piles of the girls' drawings and paintings and recycle stacks of them -- that still leaves behind stacks of the best stuff, which gets piled in piles of boxes or displayed throughout the house. Not that I'm complaining; I love it that they're into creative play like this, and it's fun to see them so pleased with their results. I took this this photo of Ivy's favourite creations from one day last week. I love the variety of subjects (clockwise from the top-left) -- a garden fountain, an ivy-covered castle, portraits of Grandma Hiebert and Ella, and a space scene with Saturn, a UFO and Earth in the distance.